The Bajaj Majesty 1603TSS OTG is a stylish and functional addition to a modern kitchen. It helps you cook delicious meals with great ease. Thanks to its large 16L capacity you can now grill, cook and toast comfortably for a large group of people. Made of stainless steel, this oven toaster griller makes a rust-free and lasting kitchen appliance. The unique heating element in the oven warms the OTG to just the right temperature and the thermostat regulates the temperature from 0 to 250 degrees to ensure you get the most crispy toasts. The Bajaj Majesty oven toaster grill has 60 minutes timer with auto shut off feature that lets you continue with your other tasks while your meal is being prepared. One of the key features of the oven includes a cool touch door handle that prevents injuries while opening and closing the door. 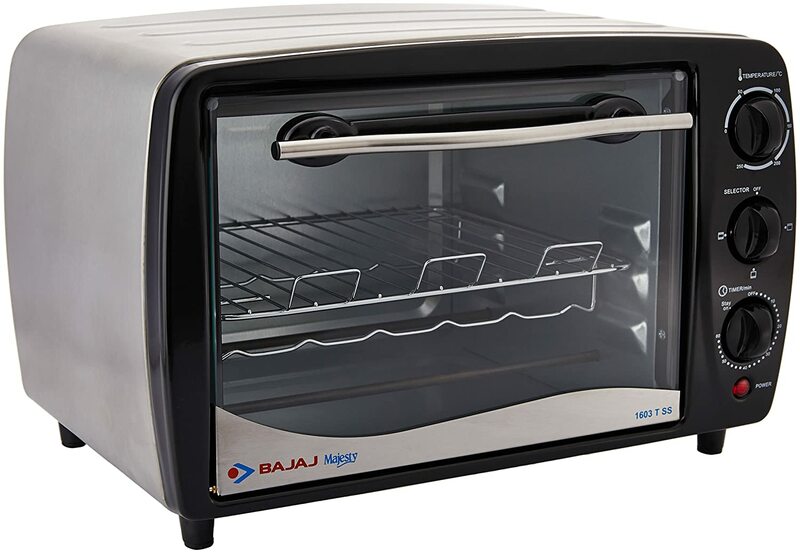 The Bajaj oven toaster grill comes with accessories like a baking tray, grill rack, tong and skew rods. Crumb tray at the bottom of the appliance makes removal of crumbs and cleaning very convenient. This Bajaj OTG consumes only about 1200W of electricity in an hour to operate.